Before you hit the post or tweet button, think to yourself: if this post is printed out and introduced as evidence in my divorce or custody matter, how does it reflect upon me? Does it show poor parental judgment? Does it show immaturity? Will it be used against me in Court? Would my spouse show it to my children? For example, posting about your late night out drinking wine might not be smart to discuss with a custody matter pending and children are involved. Hey, Mommies, everyone likes a good glass of wine once in a while, but during your divorce is not the time to post about it. I find litigants sometime feel compelled to argue their case in the court of public opinion. This is never a good idea. Private litigation should be kept private. You may feel a desire to find sympathy from your friends who have gotten divorced before you, but it is never wise to say a bad thing about the person who can decide where your children will primarily reside. Any negative comment will get back to the judge. It will end up in your spouse’s attorney’s hands and they will happily show it to the Court. 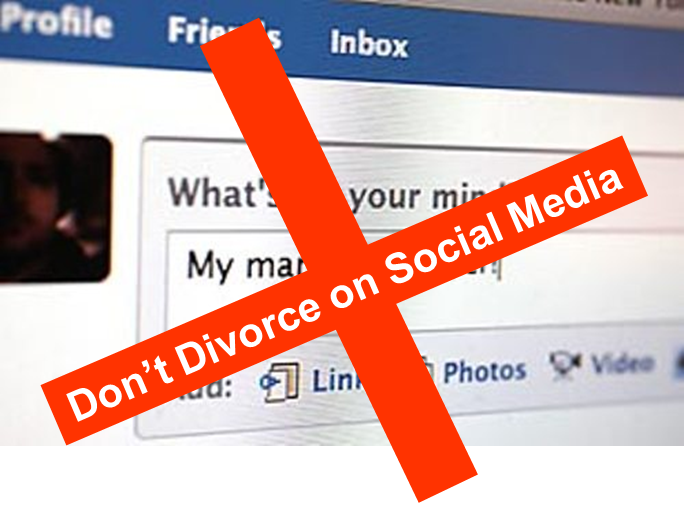 Sometime litigants want to discuss their dislike or distrust of their spouses online. We do this with our friends, face to face. Now, with the advent of Facebook and Twitter, do people want their “friends” to join them in the bashing to make them feel better? Do the comments or retweets help someone sleep better at night? No. And again, remember, anything you post will be printed and end up attached to your spouse’s custody application. Disparaging the other party is always frowned upon in any divorce, especially in a contested custody matter. If you really have to think to yourself, can this post or tweet be misinterpreted? Could this tweet or post be used against me? If so, then do not post it. It is that simple. Sharing funny or off-color posts or images may appear harmless to you, but may be misinterpreted by your spouse or any mutual friends. Fight the urge to check-in every time you go to dinner or out shopping. Do we even have to discuss posting provocative photos? 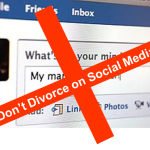 Does your divorce agreement or judge’s Order have a provision prohibiting you or your spouse from postings picture of your children on social media or on dating websites? Maybe it should. It shocks me on a daily basis how people endlessly post about their children, or where they are. You are telling the public your personal business. If you must feel the need to post about your daily routine, please check your privacy settings. Make sure you are not posting to the general public. Always remember, even if you delete a post, it will always remain on the internet. Be smart. As I say to my clients going through an acrimonious divorce or a contested custody matter, why give your spouse ammunition to use against you? Time to put the keyboard down and log out.